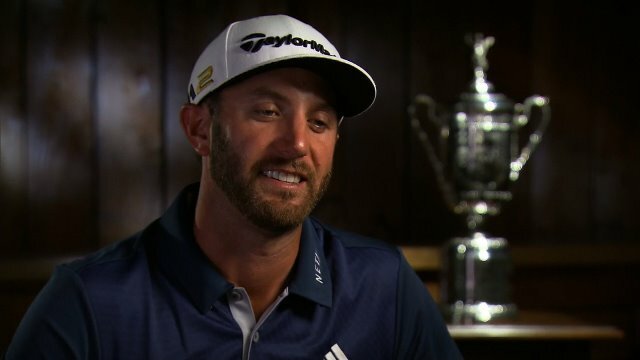 Can anyone beat Dustin Johnson? With the Masters a little over a week away, the world No. 1 enhanced his status as favorite for the Green Jacket with a third successive tournament victory. The American’s peerless 2017 form continued in Texas as he beat Spaniard Jon Rahm in the World Match Play final Sunday to become the first player to win all four World Golf Championships. Having now won six trophies in the last nine months, Johnson’s impressive run of form has established himself as the bookmakers’ clear favorite for the first major of the year in Augusta, which starts on April 6. Johnson is just the second player in history to win back-to-back World Golf Championships, emulating 14-time major winner Tiger Woods. He and Woods are also the only men to win four or more WGC titles. However, Johnson — with five WGC victories — has some way to go to match Woods’ total of 18. In an absorbing final, the 32-year-old was five up after eight holes and although he had to withstand a Rahm fightback — the Spaniard collected three birdies in four holes — the American did not trail at any point. Indeed, the US Open champion lost just 23 of the 112 holes he played at Austin Country Club, Texas. “I’m proud of how I played, the way I stayed in there,” Johnson, enjoying the form of his life, told reporters. “He made birdies on the back nine but I just couldn’t get any putts to drop. “I’ve got a lot of confidence in my game. I feel like I’m driving the ball great. I could work on the irons a little bit but it will be good to work on those next week. “It’s impossible to win every week. I know that. I’ve won my last three but I’m just going to have to keep working hard, keep working on the things that I’m working on right now. In the consolation match, American Bill Haas beat Japan’s Hideto Tanihara 2&1 to finish third. Tanihara hit an eight iron from 207 yards that rolled into the hole — only the fourth hole-in-one in the history of the WGC Match Play — to go two up at the turn, but Haas fought back on the back nine.